The president’s budget for "Investing in America’s Future" also includes $4 million to "better understand violent extremism," more than $66 billion for universal preschool, and $20 million for "climate change resilience toolkits." Under the section "Improving Incentives for Research and Clean Energy," the budget explains how it would spend $31.452 billion over 10 years for green energy tax credits. "The Budget would make permanent—and pay for—important research and clean energy incentives that the Congress routinely extends on a year-to-year basis, including the Research and Experimentation Tax Credit, the Production Tax Credit, and the Investment Tax Credit," the budget states. "It would also reform these incentives to make them simpler and more efficient, for example by … making the renewable energy Production Tax Credit refundable so innovative, growing firms can fully benefit." Before the now insolvent Solyndra received its $535 million loan guarantee from the 2009 stimulus law, the company secured a tax credit deal with the IRS to make consumers more likely to buy their solar panels. "Though the ITC is normally a 10-30 percent tax credit, Solyndra, as you may remember, was able to exploit the program with a special deal for their customers raising the credit to $6,000 back on a $10,000 purchase," wrote Doug Hochberg, press secretary for the American Action Forum. "Even with the extra tax credit and $535 million in government loans, Solyndra was still unable stay afloat," he said. Aside from green energy tax credits, President Obama’s budget pours billions into fighting climate change and promoting green energy. "Deep, persistent drought. Longer, fiercer wildfire seasons. High tides flooding downtowns. Severe storms wreaking havoc. 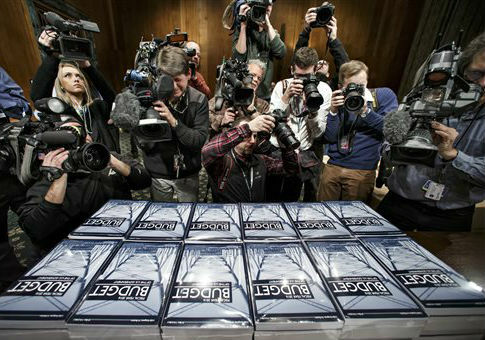 This is the picture from the front lines of climate change in communities across America," the budget reads. "As they face these immediate climate crises, cities, towns, counties and Tribes of every size and in every region of the United States have stepped up to be part of the solution." In response, Obama has asked for $239 million for the Environmental Protection Agency (EPA) to "address climate change," $7.4 billion for clean energy technology programs, and $20 million for "Climate Change Resilience Toolkits." The budget also increases research and development spending for the entire government by 5.5 percent, to a total of $146 billion. This includes $7.7 billion for the National Science Foundation (NSF) and $31.3 billion for the National Institutes of Health (NIH), which will provide 10,000 new grants. The president is still asking for billions for his "preschool for all" initiative, which would cost $66.042 billion over the next decade. A $1.5 billion increase in funding for Head Start, as well as $1.672 billion for preschool programs in fiscal year 2016 would all be paid for by raising tobacco taxes. The budget again adopts the so-called "Buffett Rule" that would require that "wealthy millionaires pay no less than 30 percent of income—after charitable contributions—in taxes." Community policing efforts are also included, including $97 million for local law enforcement training. The proposal includes increasing the number of police officers who wear cameras and "community and law enforcement engagement" training projects at 10 pilot sites. "The President has said that if anyone in the American family feels they have been treated unfairly it is a problem for all Americans," the budget said. "That is why the President is committed to ensuring the criminal justice system is safe, fair, and trustworthy for all Americans." This section also includes $4 million for a "community led-effort" to "conduct research targeted toward developing a better understanding of violent extremism and advancing evidence-based strategies for effective prevention and intervention." This entry was posted in Issues and tagged Barack Obama, Education, Federal Budget, Government Spending, Tax Hikes, Tobacco. Bookmark the permalink.